A payment gateway is an e-commerce service mostly for online stores that process credit card, debit card net banking payments etc. A payment gateway facilitates these transactions by transferring key information between payment portal and websites. TMD CC Avenue payment gateway is a connector between your OpenCart website and you CC Avenue merchant to process payment transfer. This fulfills a vital role in the e-commerce transaction process, and authorizing the payment between merchant and customer. TMD CCAvenue is proudly made in India. It is the only module which provides E-Commerce payment solution in India. This is the only module which supports OpenCart based E-Commerce Websites and it is used by 500+ store in India till date. 6. Ensure module is enabled. - Please enter your Merchant-ID, not your username or e-mail address! - Optional: Enter a Working_Key for more secure transactions. 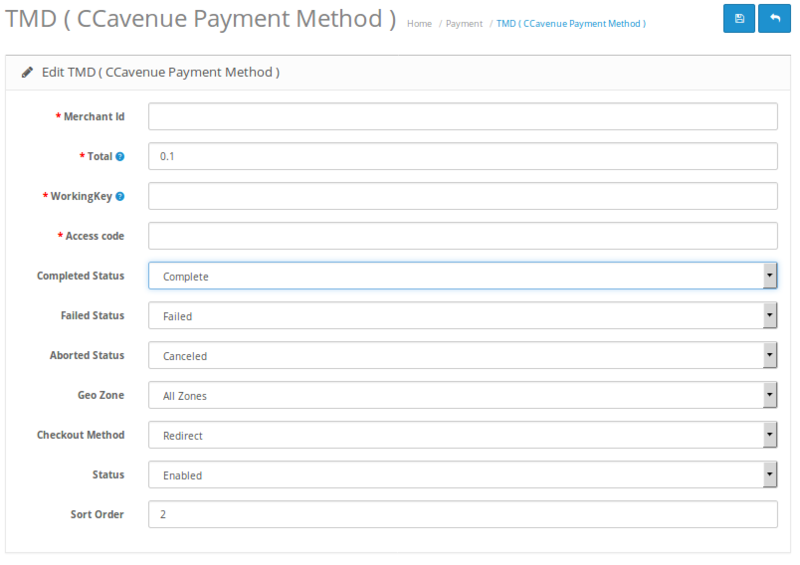 - You must activate Working_Key settings from CCAvenue panel to use redirect url.5. * You must Activate Working_Key settings from CCAvenue panel to use redirect url.5.